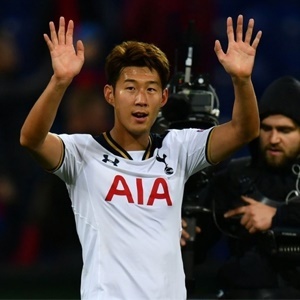 Watford - Ten-man Tottenham Hotspur stopped the rot with a 1-1 draw at Watford on Saturday but this result did little to revive an already faltering Premier League title bid. Christian Kabasele's early opener for Watford was cancelled out by Son Heung-Min's equaliser in the first half. But Davinson Sanchez's red card moments into the second second period changed the course of this game. Spurs were pegged back but to settle for a draw, meaning they've now won just two points out of a possible 12. This result might have halted a run of three successive away defeats, but Spurs manager Mauricio Pochettino will have been frustrated by a share of the spoils. With Tottenham having already lost four league games, as many as they did throughout the whole of last season to all but end their Premier League title hopes, they could ill-afford another setback at Vicarage Road. An on-out-of-sorts Spurs had never previously lost to Watford in eight previous Premier League meetings and they would keep that unbeaten record intact. But Watford will be wondering just how the match ended in a draw. Kabasele had made an important block to deny Harry Kane early on but the Belgian defender made another telling contribution at the other end of the pitch to head Watford into a 13th minute lead. Tom Cleverley's corner saw Kabasele escape from his marker to nod home beyond Spurs goalkeeper Hugo Lloris. Pochettino, despite his side's poor recent run, might have taken some comfort from Watford's home form against other leading Premier League clubs. For all they beat Arsenal 2-1, Watford have leaked 13 goals against Liverpool, Manchester City and Manchester United. And that tally increased when Watford were opened up all too easily for Spurs' equalising goal. Christian Eriksen beat the offside trap and his cross was perfectly weighted for Son to slot home home in the 25th minute. Abdoulaye Doucoure fired just past the far post in the 37th minute and Watford continued to pose a threat, with Richarlison causing Spurs all kinds of problems. Another burst forward from the Brazilian saw him contribute towards Sanchez's early exit in the 52nd minute, with the Colombian meeting his fellow South American with a raised forearm. Watford wanted a red card while Pochettino pleaded the case for Sanchez's defence. Eventually, referee Martin Atkinson showed Sanchez a red card, deeming the elbow was intentional, in a decision which had a big impact on the outcome of this game. Doucoure met Cleverley's corner but his 25-yard shot bounced off the inside post and agonisingly out. It was a major escape for Spurs, who had really gone into their shell, with Watford now dominating as a result of their numerical advantage. Watford were piling forward with Etienne Capoue forcing Lloris into a routine save from distance. And the Hornets finished the more frustrated of the two side. A handball shout against Spurs' Eric Dier was waved away moments before the final whistle, with Atkinson booed off by both sets of supporters at full-time.